So it's my first time watching for the auditionees. since there is almost no activity in rooms of candidates that do only audio streams, so another 3 girls revealed their faces today - #46, 57, 77! some drama here)) she is also a good singer. looks like #77 is pretty popular as well. another fan (and my) favorite is #53 - very good looking and a good dancer. After the SR of 6, I stayed on 78's. She's really good in talking. Can speak a few Korean and Chinese words. Greeted some fans from Taiwan and Korea. Nickname of 6 is むぅ (Muu) while 78 is ももは (Momoha) reading from the board behind her. By the way, did the management said already how many members there will be for the sister group? Are the girls going to be picked based on popularity/fans or does a management decide? ^ Sasshi decides, SR rankings probably don't mean much since majority of candidates will pass even without streaming (or only with audio streams). 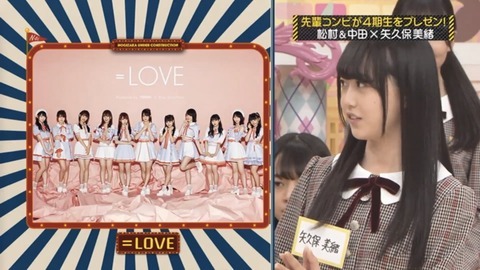 however, Nonno was 1st in =LOVE SR audition ranking. doesn't mean that her rank was a deciding factor though. Iori will be an official supporter for "Super Smash Bros. Ultimate" Nishinihon League that will be streamed on OPENREC.tv starting 1/20! many audition videos were posted on =LOVE video matome. check them out! Today (190121) is Maika's birthday! Happy birthday Maika, wish you the best! that's it, =LOVE's sister group SR audition has ended today. the only thing that is left is the final examination on 1/26. it is still unknown when new members will be introduced to public though. #53 - this girl is a must have. I'll be shocked if she's not chosen. she has everything: great looks and figure, young age, fine skills (9 years of dance experience) and sweet personality. #57 - like 53, another high-spec all-rounder. her only con is her age (19). which might be fine if her position will be of a leader/older sister. #12 - interesting and unusual kid. 14 years old, but likes idols from 70-80's. very serious, old-fashioned and well-mannered. she's probably an ojousan from rich family. a mix of Kiara and Shoko. #78, #60 - 1st and 2nd in SR ranking with great lead, reaching 10k viewers per stream, and one of the most discussed girls on 5ch. both have outstanding characteristics: #78 looks and #60 singing, but they both are kinda too short (#78 - 144cm!, #60 -151cm) and too professional (#78 already smells of scandal ^^; ), probably not Sasshi's type, so I doubt they'll be chosen, unless they have some kind of agreement with Showroom to take those candidates who ranked in SR top. Oki Yuka (STU) sings "Kiara, Tasuke ni Kitazo"
her oshimen are Kiara and Iori. I actually just got into the group recently and they are so cute! Plus the music too. I don’t have a favorite yet which is to be determined. I also been following up on the sister group SR section and I’m rooting for #12 - Junnichan to get in! ^ how did you find them? Murashige says that she threw paid gifts in Anna's showroom. the auditions for sister group are officially over! #78, 1st in SR audition, didn't make the final cut, as expected. in addition to Hana, Risa and Nonno, Hitomi and Mirinya (they were shooting for PlatinumFLASH outside yesterday) got a sick leave due to influenza! I wonder how will they manage the dance formation with only 6 members?.. it would be interesting if they'd drop the dance altogether and only sing. btw, Naatan reached 100k followers on Twitter! it was announced that members of sister group will be introduced on 2/24! less than a month to go!